From the first day to the last, the month of June has been filled with adventures, occasions to eat ice cream, cow hats and 2,766 miles. June started with World Milk Day and Dairy Days in Hutchinson, Minn. Here I visited with community members who stopped by to enjoy the cheeseburgers, ice cream, milk and cheese samples. Being able to participate in the cow milking contest was the highlight of the day. 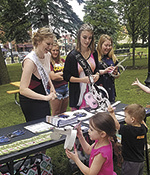 June continued with the Stearns County Breakfast on the Farm and the Grand Old Days Parade. At the breakfast on the farm visitors had the opportunity to tour the farm, visit a petting zoo and obstacle course, and enjoy dairy foods. As June continued, I judged a butter sculpting contest and gave a presentation to students at AFSA high school. Next came the Mille Lacs County Lunch on the Farm, which offered dairy-related activities for kids and adults alike. 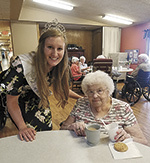 June continued with a nursing home visit, where residents celebrated National Dairy Month with the help of milkshakes and a talk about cow care and dairy food’s nutritional value. The Riverview Open House offered farm tours, dairy coloring books and dairy foods for all to enjoy. In Alexandria, proceeds from the cheeseburger baskets and milkshakes at their Dairy Days went towards donating milk to their food shelf. I had the opportunity to share about dairy’s nutritional value at the Winona County government center during their Lunch’N’Learn session. Next, I visited Benson for their dairy day where I passed out dairy-themed items and had wonderful conversations with their community members. At the Wadena County Fair, I gave out cheese samples, spoke at their dairy show and helped judge a hot dish contest. June ended with the Dairy Days in New Ulm and the Todd County Breakfast on the Farm. In New Ulm, I served milk and root beer floats for community members and was interviewed on the local radio station. The Todd County Breakfast on the Farm brought more radio interviews, farm tours and conversations. My favorite part of the day was speaking with those in attendance on the coach bus that shuttled people to and from the farm. There were events showcasing the dairy community and celebrating National Dairy Month. Thank you to everyone who hosted, helped plan or attended a dairy day, breakfast on the farm or other June Dairy Month event. The hard work you put in results in a great opportunity to share dairy farmers’ stories and the goodness of nutritious dairy foods. Whether farm families opened up their farms for tours, helped serve ice cream at their grocery store or shared a post of their favorite dairy foods, each contribution is important. 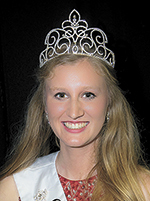 National Dairy Month has come and gone, but I am looking forward to more adventures as I finish my time as Princess Kay. In July and August, I will be attending more county fairs, breakfasts on the farm, farm camps and parades. Happy National Ice Cream Month to all of you. Don’t forget to celebrate accordingly with lots of ice cream.